My approach to baking is a bit strange. It is difficult for me to ever start with a recipe to execute and shop for it. I just don't have that kind of vision. I begin with something that catches my eye at the market or in the dry goods shop, and then sit in a modified lotus position and ask the ingredient what it wants to be, hiding the knife behind my back. Having a basket full of little pêche de vignes direct from a vinyard keeper in a bowl on the buffet to remind me that I had to do something with them, they began to nag. 'cake! cake!' they chanted, each time I passed. I was sorely tempted for a moment, while I flipped through my favorite fruit dessert book, to poach them in wine. But they were already blood red inside. The whole color gradation thing would be lost. I hit a recipe on page 184 that used plums, and by twisted logic (the real peche de vigne is no larger than a plum), I had pretty much made up my mind. 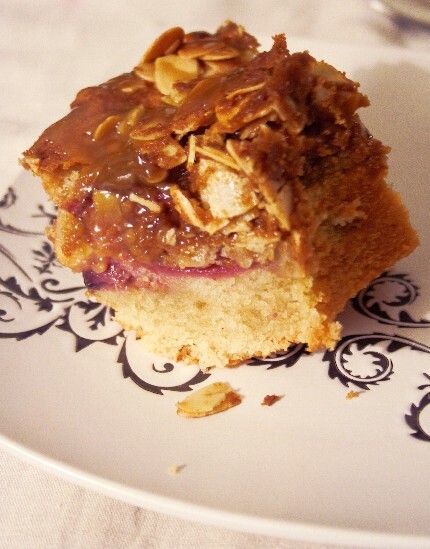 Spiced Plum Streusel Cake with Toffee Glaze. Sound's good, huh? Would it be alright as a Spiced Pêche de Vigne Streusel Cake with Toffee Glaze? I had no problem with peaches and almonds. Why not? But what is a streusel? What does a streusel look like? Is it going to look pretty? I had guests coming! I did a little google image search. Stodgy boring options slapped me across the face, and it stung. Hmm, maybe I won't do a streusel. I even searched the name with the German word for cake, hoping for inspiration from this dessert's motherland. The flat, boring, grey looking shadows in brownie pans hovered in the shadows like evil hobgoblins, frightening me. But then I thought of David. Everything coming out of his kitchen is elegant. He didn't spend 12 years in the kitchen of Alice Waters to serve boring plain desserts. One really must trust. I scanned the recipe again. Cardamom. I thought to myself, if I have cardamom, this cake was meant to be. I had the pods, and this in itself told me that all was right with the streusel. The gods had given me a green light. I opened the pods and took out the insides. I crushed the cardamom in my mortar and pestle, not having the ground spice. 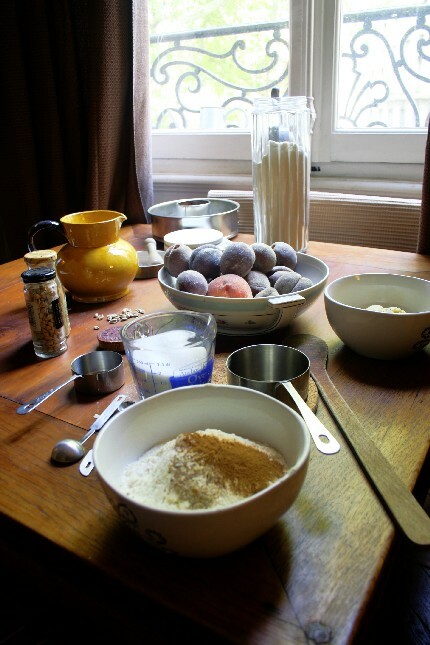 Out of expat technical instinct, I used the flute in my pan, because since it was a recipe for American kitchens, I had a concern about French flour. French flour, even the common type 155, is ground with a different method and sometimes American cake recipes won't work correctly here in this country. I have found that French cake recipes translate beautifully to American flour, but American recipes sometimes get lost in translation coming the other way to France. Using the flute made it so that the cake would cook all the way through. Well, this streusel, using the little plum sized peche de vigne, was indeed elegant. Elegant in just the style I adore, simplicity, with the perfect spices, and the almond and fruit are a winning combination after all. Isn't it wonderful how something so simple can be so perfect? The sliced almonds in just the right ratio. The toffee syrup was as easy as one two three. I thank the pastry chef for this elegant and simple recipe, which was noted in my kitchen notebook just as soon as the guests had kissed us and each other and dissapeared with smiles on their faces into the night. Lovely streussel! and i love your plate design...which matches the ironwork right outside your window! That looks so delicious! You've inspired me to get in the kitchen and bake today. This is magnificent! Even the light shinning through your window on the table is delicious~I know it would melt in your mouth! I think your cake looks and sounds wonderful! I adore the second photo in this post as it is very warm and comforting. Very yummy looking cake. Glad it was a success! Thanks for sharing. if only these tasty treats were available on Circle rd. Dear Eva, thanks for coming by. I am no streusel expert, but I believe it is that which is crumbled over the top of the cake! Thanks for your streusel posts, they are lovely.